Almost 2.500.000 people have left Syria since the beginning of the conflict in 2011 (update february 2014). This is one of the largest refugee exoduses in recent history, and it still ongoing. According to UNHCR Syrian refugees in Jordan are 591.922 (update 4th of February 2014), being the others distributed in the other neighbouring Countries: 593.830 in Turkey, 903.695 in Lebanon, 217,144 in Iraq, 133,251 in Egipt. The largest part of refugees is settled in the North of the Country, in particular in Mafraq Governatorate (195.564), Irbid (129.837), Amman (147.348) and Zarqa (50.764). The year of 2013 witnessed a massive arrival of Syrian refugees to Jordan. In total, 250,000 Syrian refugees were welcomed by Jordan between January and October 2013. 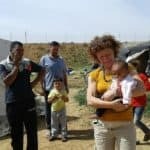 Jordan Governement is still keeping on with its open borders policy, so that refugees continue to enter the Country with an inflow of about 1000 new persons a day. Approximately 20%t of Syrian refugees reside in refugee camps. Refugees are received and assisted at the border by the Jordanian Armed Forces (JAF). The JAF transfers the refugees to a screening centre at Rabaa Al-Sarhan, before onward transport to the refugee camps. On arrival in the camps, refugees are registered, receive medical screening, are assisted with food, shelter, and are provided access to water and sanitation, education, psycho-social and other services. The largest refugee camp is Zaatari, 10 km East of Mafraq, administered by the Jordan Governemet-appointed Syrian Refugee Camp Directorate (SRCD), with the support of UNHCR and the management of JHCO – Jordan Hashemite charity organization . More than 350,000 Syrians have been registered in Zaatari camp since its opening in July 2012. As for February 2014, UNHCR esteem is of 129.276 officially refugees registered in the camp. But the real number of residents seems to be lower, that is to say around 80.000 persons. 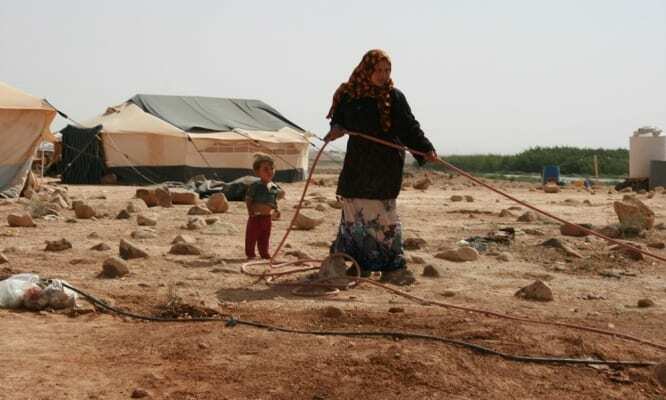 A large number of refugees have thus left Zaatari to urban and rural areas in the Country. 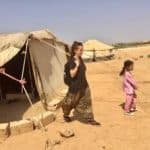 Although they are not allowed to leave the camp, because the Jordan Governement doesn’t want them to be dispersed around the Country, many refugees illegally leave the camp and try to find a place to live and work elsewhere. This is what originates the incongruity between official registration data and the real number of people living in Zaatari camp. A series of smaller camp-sites are also housing refugees, like King Abdullah Park (Irbid Governatorate, JHCO management) , and Cybercity (IOM – International Organization for Migration and UNICEF coordination). Syria Emergency: don’t leave them alone!